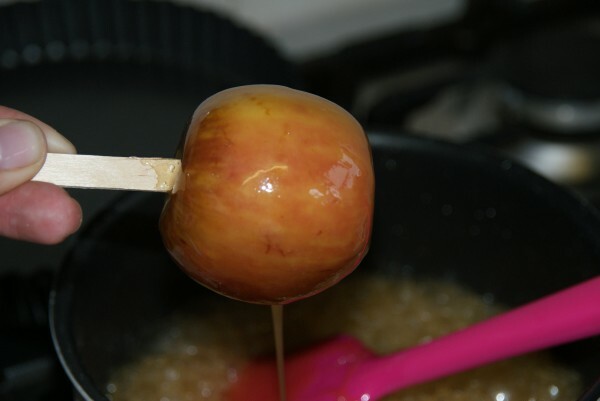 How to make your own toffee apples – great for this time of year, making your own is easy and brilliant fun! Plus who doesn’t love a toffee apple? Ideally you will want to be using a sugar thermometer, but it is possible to do it without and I’ve given the instructions for what to watch out for when the time comes! 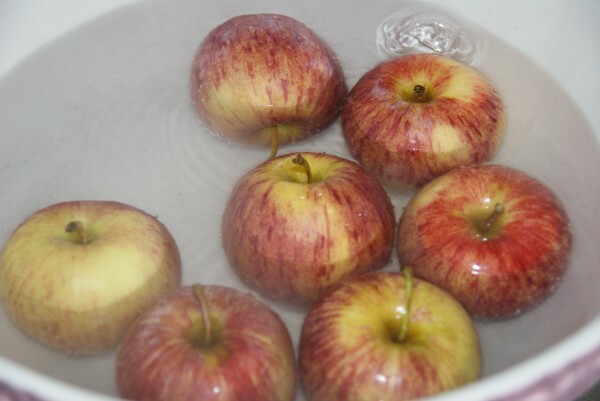 Place your apples in a large bowl and cover with hot water. Not boiling as it will scald the skins. Allow them to stand for a couple of minutes. This removes the waxy coating that some apples are given, if it’s not removed the toffee might not stick! Drain the water and remove the stalks, dry them well. 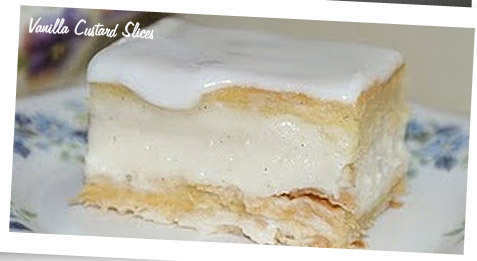 Set them on a baking tray either lightly oiled, lined with baking paper or a sheet of bake o glide. 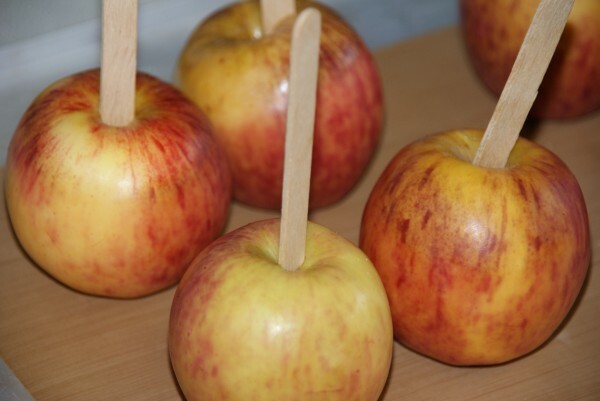 Insert a wooden lolly stick into the top of each and push them through the apple. The sticks should not come out the other end but should be far enough in to hold them securely. 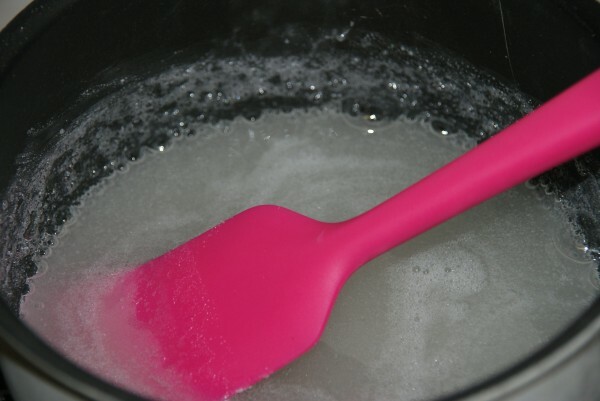 In a medium sized pan place the caster sugar and water. Heat it gently until the sugar dissolves and the syrup turns clear. 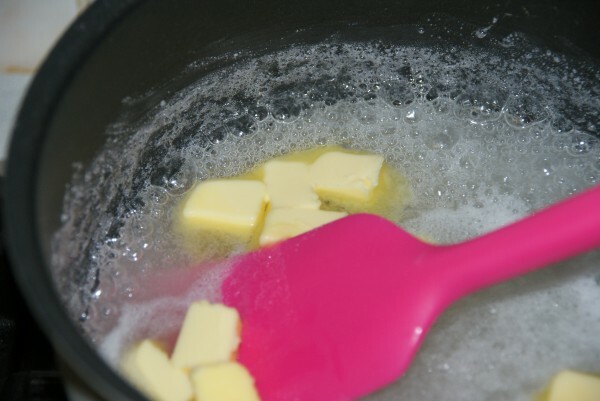 Add the diced butter, vinegar and golden syrup and continue to heat until the mixture boils. The sciencey bit – the vinegar provides acidity which helps the sugar boil correctly without burning and to allow the toffee to form the correct crystalline structure, the butter is for a really lovely toffee taste and the golden syrup to stop the sugar crystallising – you always wanted to know that didn’t you?! Now you want to boil the syrup until it reaches 140c. This is the ‘hard crack’ stage. 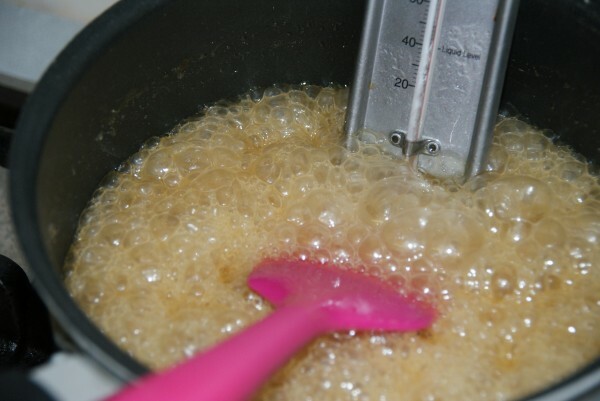 Monitor your sugar thermometer or test it by dropping a small bit of toffee into a bowl of cold water. If it has reached the correct temperature it will form a hard ball of toffee in the water which when felt between your fingertips is hard all the way through. Over a medium flame the pan needs to boil for about ten minutes but do keep your eye on it carefully so it doesn’t go too far! 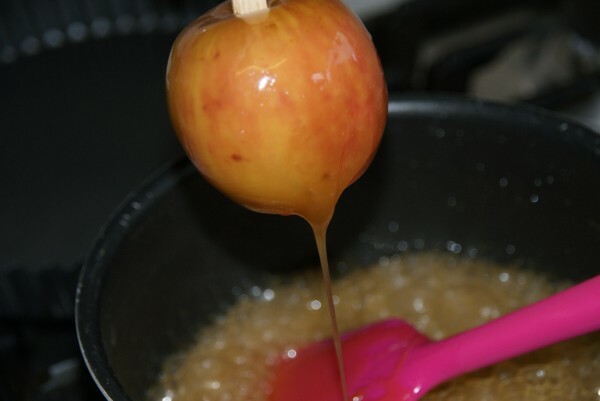 When the toffee is at the correct temperature remove it from the heat and holding an apple by the wooden stick dip it in the toffee and swirl it around to coat. Lift it above the pan and swirl to allow the excess toffee to come away. 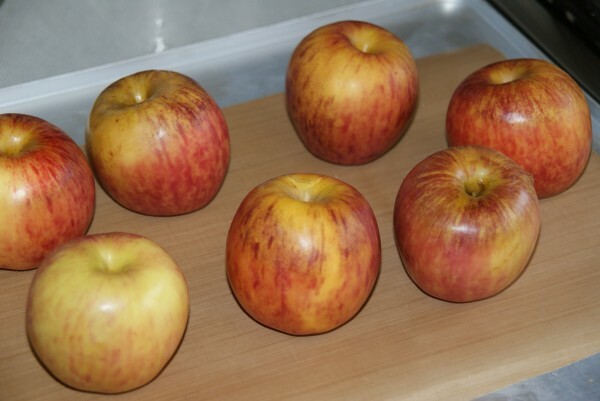 Set it onto the baking sheet to set and continue to work your way through the apples until they’re all coated. If the toffee in the pan becomes too thick place it back on the heat to warm up again so that you can work easily with it again. 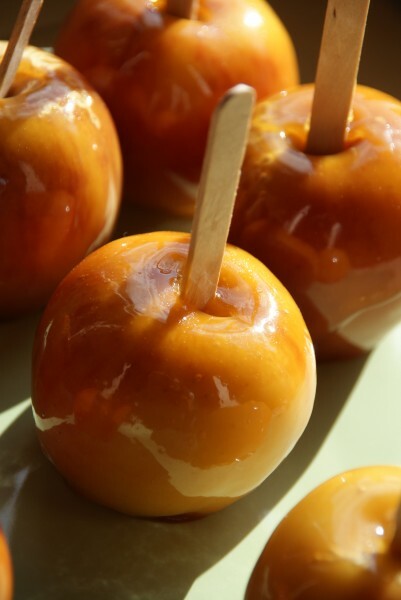 Toffee apples don’t store so well as the toffee absorbs moisture from the air and goes sticky again. They can be made the morning or evening before and then stored in a dry place, not the fridge. 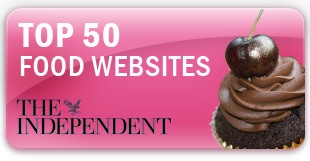 Wrap them in cellophane for Halloween or Bonfire Night gifts! This entry was posted in Apple, Bonfire Night, Children, Halloween, Treats. Bookmark the permalink. Great! I’ll be making these for bonfire night but as it’s only my sister and Iwho like these could I half or even quarter the recipe so we don’t end up with sticky toffee that we have not been able to eat. I love toffee apples. They remind me of my childhood. Love your recipe tips, was great to see you on the Great British Bakeoff recap show – always thought you shoulda won! They look so good. 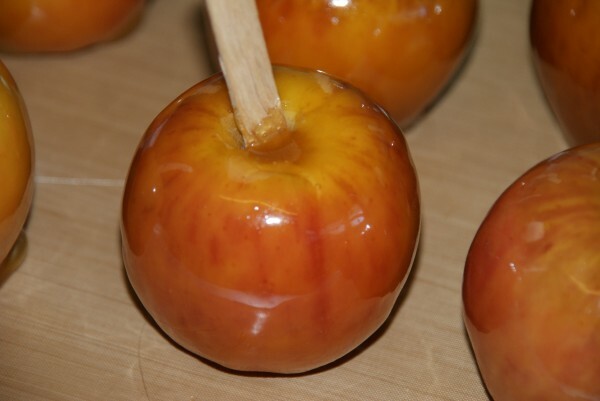 I love toffee apples. 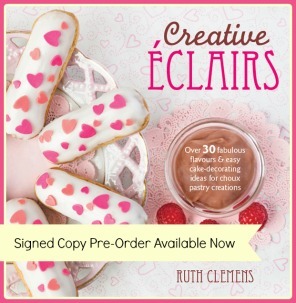 Would it work if I added food colouring to make the toffee pink? 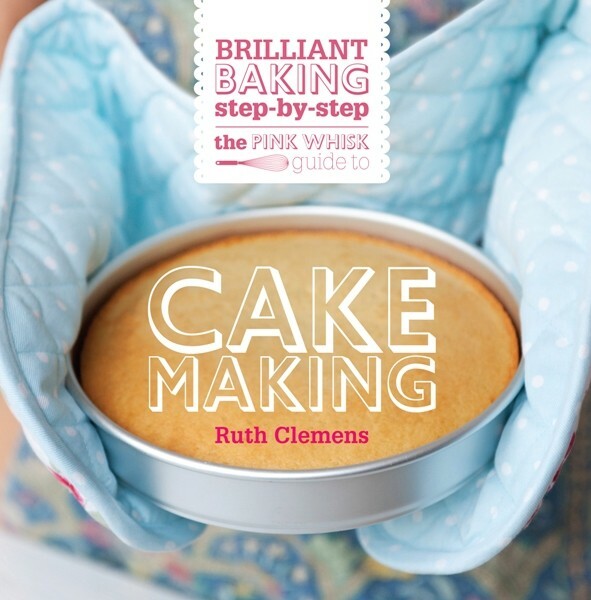 Follow Ruth Clemens's board The Pink Whisk Christmas Baking on Pinterest.